In a simple design, every element has to pull its own weight. A messaging app — no matter what frills it’s decorated with — should be a simple design. And its simplest elements are words. Even the simplest design carries the weight of expectations for how it ought to work — and when its elements don’t work as expected, people react. Strongly. Last year, the words we added to the Intercom Messenger interface generated some intense reactions to the most minute details of grammar and phrasing. As our product manager, Brian, said to me: at least we know our words are being read. Getting under the skin of those reactions and the expectations behind them has changed how we think about and write for our Messenger. And as we’ve written before: when you change how you write for a product, you change how the product is perceived. You change expectations. Messaging apps — puppy filters aside — are usually designed for one thing: to let you talk to someone as naturally as you would if they were in the room with you. If the internet has proven anything, it’s that people feel very strongly about what they feel is ‘correct’ grammar. This simplicity is core to messaging’s power and popularity. That’s why consumer messengers like WhatsApp spread so easily across all demographics: they were an easy leap from natural conversation, and from the native messengers everyone already had in their phones. A product like Whatsapp allows you to do more without having to learn more. 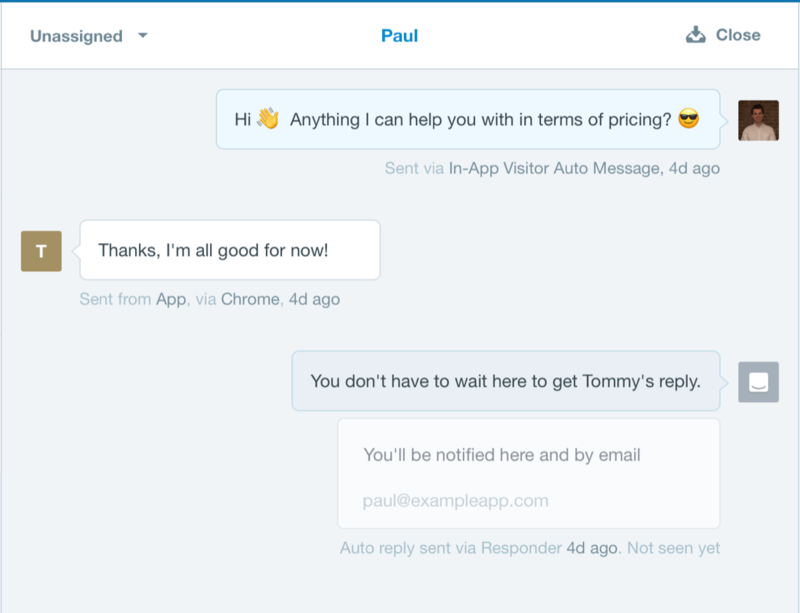 Our own Messenger took that simplicity to B2C conversations, so that businesses and their customers could message each other directly. While business messaging is still essentially the same simple platform, it has the potential to be more socially complex: that’s because the participants in the conversation have specific roles, and specific jobs they need to do. A messaging app isn’t primarily a set of screens and interactions. Underneath that, its parts are pretty much like the parts of a script: there are speaking roles, and stage directions. There’s also one non-human speaking role. It’s carried out in the form of a bot. The other parts of the interface are the stage directions — messages from Intercom that appear in the flow of conversation, and in the frame of the app itself, that provide instructions and context, so the human participants know what’s going on, and can act accordingly. Stage directions: the system lets participants know when a message has been sent, how it was sent, whether it’s been seen and so on. When you have a conversation with someone in the real world, you usually know who you’re talking to. If only from body language, you have a sense of your role in the conversation and your relationship to the other participant. That knowledge affects what you say and how you say it. It also affects your expectations of how the other participant will reply. Here, a real human using Intercom to talk to a customer was assumed to be a bot: an example of our social expectations of a conversation evolving to keep pace with technology. Expectations play a big role in how any conversation evolves. And relationships evolve through conversation. If the reply we receive in a conversation with a business doesn’t match our expectations of how the conversation should go, it changes how we feel about that business. That means one thing is critical when designing for conversations: everyone needs to understand who’s speaking at all times. Remember our non-human speaking role? Our ‘bot’ in Intercom — though it’s designed more like a courier than a full participant in the conversation — is meant to deliver information to the customer and carry data back to the business. People often have a ‘live chat’ expectation when they use messaging apps on websites and apps, by which I mean they expect a relatively immediate, call-center-like experience. But like any text message, our Messenger is designed to be asynchronous — it’s not always live. The primary job is to get customers an answer, but they don’t necessarily have to wait around to get it. The key word here is ‘soon’. That word is polarising: we knew from user testing that people interpret it to mean either ‘right now’ (aka “this is live chat”) or ‘in a long time’ (aka “I may never get a reply”). So we wanted to avoid it. Content design rule #1: Don’t use the word ‘soon’. There’s a great deal of trust at play in our Messenger: trust between Intercom and the businesses that use it, and trust between them and their customers. Changing the text wasn’t a simple matter of brainstorming different copy. When we deliver messages to do a specific job, like ask for contact details, we have to speak on behalf of a business. This can have surprising complications: one of which is knowing the gender of the precise person we’re speaking for: the member of the team who’ll reply to a customer. We wanted to refer to that teammate like this: “This person will reply as soon as they can”. As the bot was doing the speaking, it had to refer to this person with a pronoun: ‘she’, ‘he’ or ‘they’. In this context, these words — pronouns and adverbs — are load-bearing. They’re individual words that perform a job. 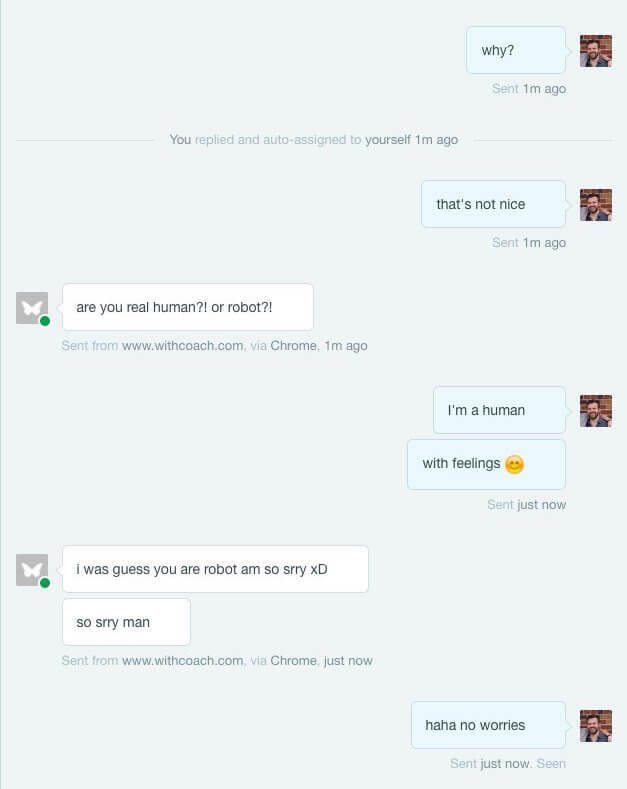 The pronoun makes it clear that the message is not from that teammate, but from a bot speaking on their behalf. The adverb manages that time expectation, as best a single word or phrase can do. We were constrained on both counts. Now, the singular pronoun ‘they’ was 2015’s word of the year — so it was technically correct to use it. So we released a fix with “Brian will reply as soon as they can”. But if the internet has proven anything, it’s that people feel very strongly about what they feel is ‘correct’ grammar. Businesses felt it was incorrect to use a gender neutral singular ‘they’, and it didn’t always translate well into other languages. That meant we’d failed in our primary job of communicating on each business’s behalf in a way that felt right to those businesses. Changing the text wasn’t a simple matter of brainstorming different copy. We had to rethink our priorities, and reconsider the jobs we were trying to get this bot to perform. We realised we had to set one job — setting reply expectations — aside, and focus on motivating customers to leave their contact details. That was the primary job, and trying to get one message to do two jobs had failed. It took a lot of work to get to those 8 simple words: getting to the right phrasing for a specific job means having absolute clarity about what you want to communicate, and getting rid of anything that competes with that job. By switching our focus to the job that meant a customer would have a better chance of getting their answer, we could communicate more clearly. Content design rule #2: Be careful your sentences don’t shoulder too large a burden: one job per sentence is enough. Everything we’ve learned about our Messenger this year has shown that tiny changes have a big impact. Every word we change and every new approach we take to a particular problem has a monumental effect disproportionate to its size. A messenger is a human space, and our customers respond to it as such — with a strong sense of ownership and of what feels right. So we take care over these elements; we sweat the details down to every pronoun. With every detail, we push our Messenger design forward, and see how much weight a simple design can really carry. Turns out: a lot. If you get the balance right.